Have been working on this cardigan over January. I have two piles of leftover grey yarn, neither is enough to knit a whole sweater so I thought I would combine them in a random striping pattern. The ripply texture of garter stitch and the different tones of grey remind me of the lichens I saw on a road trip to Bruce Peninsula two summers ago. 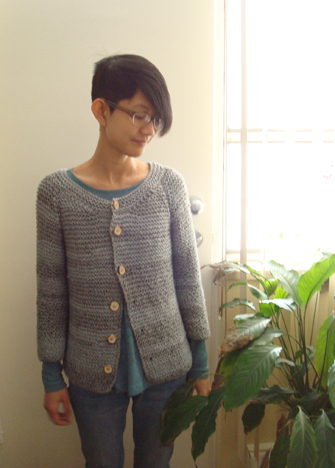 I followed this cardigan pattern from Pierrot. It’s has a nice chart that I learned to read with the help of this wonderful document. I followed all the instructions for stitch count, increases and decreases in the chart, but I used a larger needle (7.5mm), made button holes all the way down the front (though they’re not quite spaced evenly despite my best efforts. Oh well) and knitted everything in garter stitch, which I think has a simple, rustic look to it that I really love. 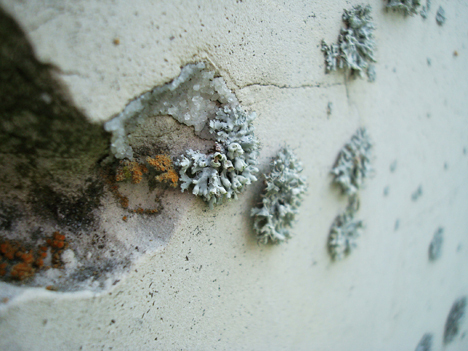 Like lichens. 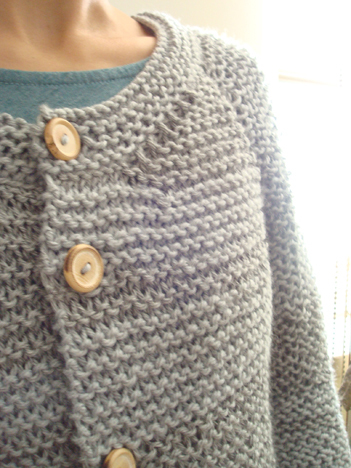 And I thought some nice unpolished wood buttons would go well with the simple garter stitch. I’ve been wanting to make a versatile grey cardigan for a while and I think this is it! I’m very happy with it. 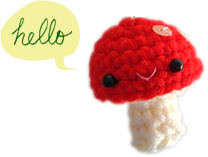 And I think I’m starting to appreciate the slower pace of knitting. I still avoid circular needles as much as possible (I chose this pattern mainly because it’s knitted flat and seamed), but maybe one day I’ll start to appreciate them too. And because it’s knitted quite loosely with the relatively large needles I crocheted all the seams together with a 6.5mm hook. On a slightly separate note, I mentioned a couple of times that I’ve crocheted the Masonry Jacket, but it turned out really rather stiff and doesn’t look all that good on me. So I’m pretty sure I’m going to take it apart to make something else. I’m thinking of knitting a basic sweater in garter or moss stitch. Would be nice to wear over collared shirt. Will keep you posted! Have an awesome week, everyone! Trish, I just love everything about this sweater! The softness of the greys, the random stripe pattern, the scoop of the neckline, the wooden buttons. I’m glad you’ve had something to work on that’s relaxing. You have a good week, too! thanks amy! and the loose stitches make it so soft too!